This pub has improved greatly since I started going here, some years ago.. It now has 9 handpumps with a good selection of beers, a far cry from when Doom Bar was as good as it got! Maybe they're trying to compete with the wide choice of beers offered by Edgar Walace, just round the corner, which can only be a good thing. Can get crowded when there's a 'big' game on the telly but it always seems a friendly enough crowd and the bar staff seem happier now than they once were. Considering it's location you might expect it to be full of tourists but I've yet to see much evidence of that. Good to see a pub on the up! Nice characterful old pub with friendly bar staff. The food and beer and consistently good. We had a Christmas meal in here last week and I was impressed with the quality of the food and the timing of its being served. On a recent visit the Kronenbourg was good and reasonably priced for London (about �3.80 a pint), plus the staff were helpful and polite. 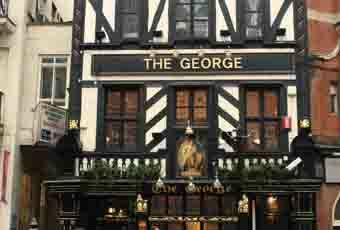 I would visit The George again. 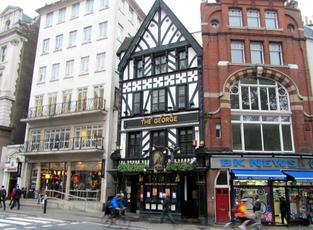 We went to The George because we had tickets for The Funny Side show which takes place in their function room upstairs. When we arrived we liked the building from the outside, but must admit it felt a bit too dark inside. We had booked a table which was ready for us. The food was good and reasonably priced. Nothing too special, but we enjoyed it. We had a bottle of sauvignon blanc from NZ which was very nice. Since we still had about an hour until the show we decided to get another bottle and have some dessert. Unfortunately they didn't have any more wine; not the one we had before, and no other sauvignon blanc at all. When I reacted with surprise the girl at the bar simply shrugged her shoulders. With this, we skipped dessert altogether and went to find another place where they would have wine. We came back for the comedy show, but couldn't really drink anything else as they ran out of wine - on a Saturday night! As a summary, the food was ok and the one bottle of wine they had was very nice. The staff was not particularly friendly. I think the place could be more attentive on cleanliness as our table was sticky and the loos were not that clean. My impression is that they get the trade regardless because of their location so the staff don't really make an effort at all. We would go again for the comedy show, but we would definitely eat and drink somewhere else beforehand. Wouldn't really recommend this place to anyone as there is nothing special about it.